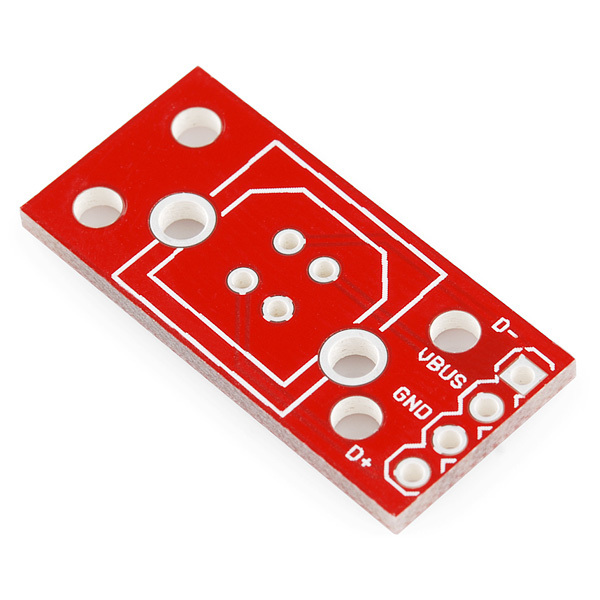 Simple breakout board for the USB Female Type B Vertical Connector. 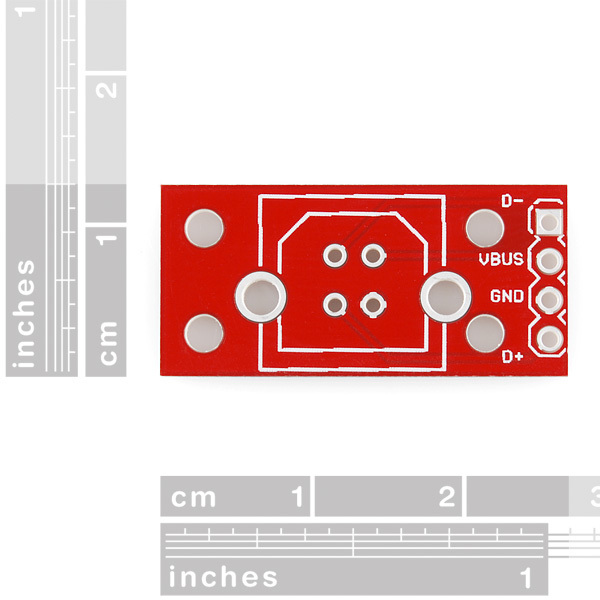 We primarily designed this board so that you could panel mount a USB connector. Handy when creating those fancy looking enclosures that need a USB port. Breakout board is shipped bare. All four USB pins are broken out. could we get a dimensional drawing on the circuit board itself? So we know where the wholes are drill holes line up? I still think that Sparkfun thinks we'd need that breakout board to be something short of a miracle. You're right, we should do more of that. FYI the board is 1.05" x 0.5", and the holes are at 0.115"/0.115", 0.115"/0.385", 0.835"/0.385", and 0.835"/0.115". 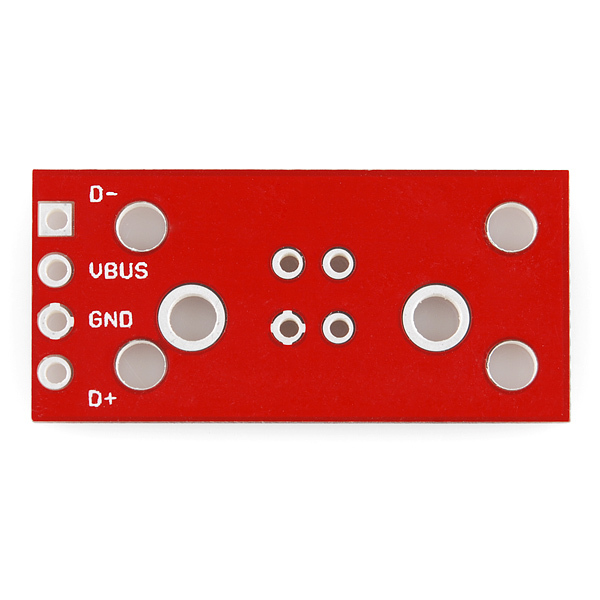 BTW, if you get the free version of EAGLE from CadSoftUSA.com, you can open the board file and get the exact location of each hole and component on all our boards. It is not obvious which side to mount the usb connector to!!! Normally the printed side is the component side; This board has printing on both sides. How about a picture of a properly assembled board? Scratching my head on this one! The board is a too small... I'll have to find some miniature screws and stand-offs to mount this to my cabinet. Make it bigger!!! Provide more clearance for a stand-off and the head of the screw so it does not short to the terminals. How come no breakout board for horizontal mounted USB? 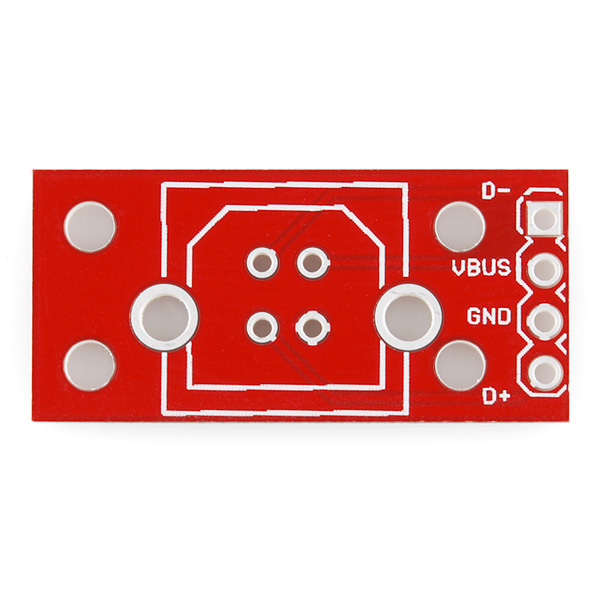 Any plans to make one of these for the right-angle Type-B connector? The Eagle File .brd shows that GND is not connected. Is this right? Nope, there's a ground plane that both the connector and header are connected to. In EAGLE, if you click the ratsnest button ("X" shaped button near the bottom), it should flow the ground plane and show the connections. How can i connect my vertical USB B port to an arduino pro mini? Is there a way i can connect this board to FTDI brake out board to covert the USB signal to serial communication? could this be used with a type A USB?